The purpose of this service is to support and “Motivate to Graduate” students, increase retention in schools, assist in transitioning from high school to college, and offer other career alternatives to students. Like all students, Native American college freshmen must adjust to life on campus, the difference between high school and college classrooms, and being away from their families. Yet unlike other students, many Native students must also adjust to life off of the reservation. This is a huge transition that encompasses cultural, spiritual, emotional, as well as economic and lifestyle shifts that far exceed what non-Native students face. The American Indian Education Fund (AIEF) desires to see an increase in Native American students graduating from high school and completing college and vocational programs. To facilitate these positive changes, we partner with schools* offering them the opportunity to apply for a competitive grant. 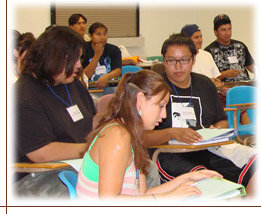 Unlike other students, many Native students must also adjust to life off of the reservation. Academic survival and study skills such as: problem solving, organizational skills, and time management. Personal development skills such as: conflict resolution, goal setting, leadership skills, motivation, needs assessment, resiliency, self-esteem, stress management and workplace basics and ethics. Career Exploration such as: career decision making, career exploration, jobs of the future, and job seeking skills. This is a one year grant given to Middle schools, High schools, tribal colleges, universities, and technical/vocational schools* to help develop and sustain a Transition Camp for incoming students. * Priority is given to institutions located in the states of: Alaska, North Dakota, South Dakota, Wyoming, Montana, Hawaii, Idaho, Nebraska, Minnesota, Nevada, Arizona, Utah, and New Mexico. Middle schools, High schools, tribal colleges, universities, technical/vocational schools may apply. Please note: at this time, we are not accepting new applications. Please contact RaeAnne Schad at 866-866-8642 or rschad@nativepartnership.org if you have any questions. If you are a Native American student in need of emergency assistance, please talk to your on-campus advisor.